First day back after the Christmas break and the Virgin Active team were straight back into the swing of things, creating the first set of bespoke motivational emojis and GIFs …. dubbed the “Emojivation Pack”. Despite Brits’ love of social media posting about fitness, we noticed that only a handful of fitness-related emojis exist to help gym-goers share their active highs and lows. 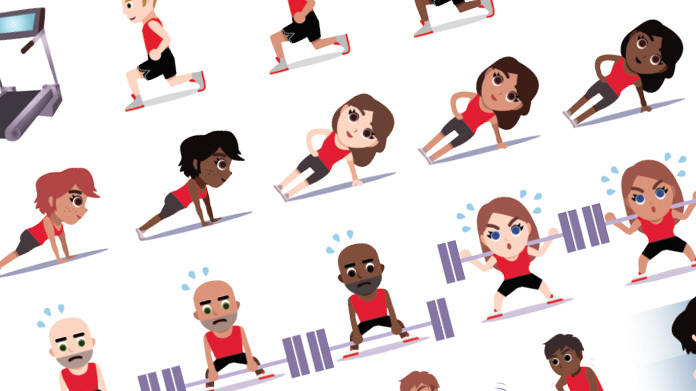 To help fitness fans express themselves better and share their gym pursuits, Virgin Active created 36 bespoke emojis that reflect real life health and fitness moments. We created the Emojivation Pack to help and inspire people by reflecting a whole variety of activities and challenges, workout moves, emotions and equipment – from fitness fans working up a sweat to a chilled out yoga fan in a tree post, to people relaxing post-gym in a Jacuzzi, various gym equipment such as boxing gloves, rowing machines and weights … and many more. The team secured some fantastic coverage including Daily Telegraph, Daily Star, Hello Magazine, LOOK Online, Gay Times, Brand Republic, Campaign Live and loads still to come. And, what’s more, we seem to have started a celebrity social trend with #emojivation being a big hit amongst key influencers as the likes of Richard Branson, Millie Macintosh, Ella Eyre, Union J, Matt Johnson, Zoe Hardman, Lilah Parsons have got involved. So too the fitness bloggers including AJ Odudu, Fitness on Toast, Carly Rowena and the Lean Machines, all of whom have been posting their mini-me #emojivation emojis. This social buzz resulted in #emojivation trending on Twitter on day two of selling in! So far, the total the #emojivation pack has been seen by 55,400 people and has seen almost 7,000 emojis sent. The campaign is currently being used across all Virgin Active markets – South Africa, France, Portugal, Spain – so we’re set to see many more downloads across the globe in the next few weeks. A lovely way to start the new year and a piece of work we’re proud to have delivered with our friends at One Fifty.